Annual flower garden design doesn’t have to be hard. I really want to make this super easy for you, so you can relax and just have fun with it, rather than be intimidated and stressed out trying to figure out a fancy garden design someone else created. 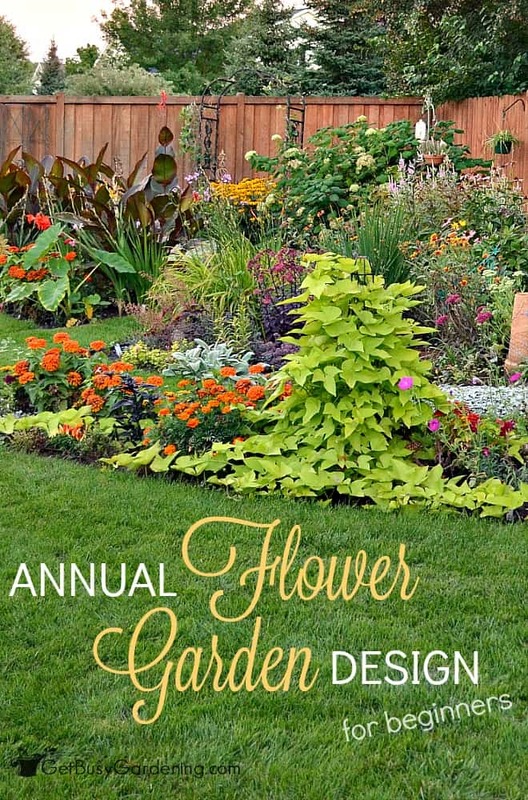 Here are easy, step-by-step instructions for designing your annual garden. Some of you may be feeling intimidated by the thought of having an entire garden area dedicated to annual flowers because designing it seems way to complex. 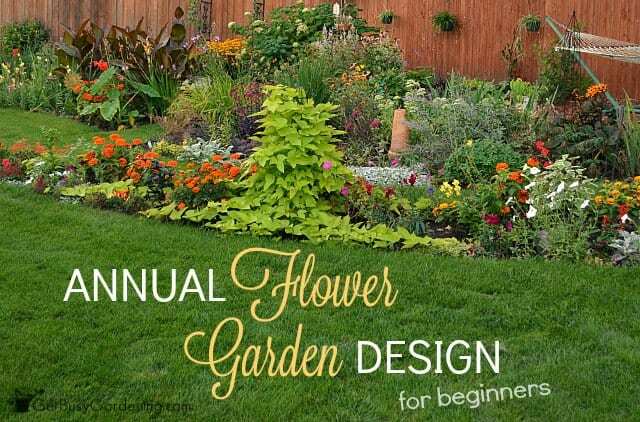 I’ll be the first to admit that I am not a professional garden designer (I’m not good at math), so if you’re looking for a fancy annual flower garden design that shows you exactly how many plants to buy, and exactly where to put them in your garden… then you’re in the wrong place. Honestly, I was totally intimidated by formal garden designs like that when I first started gardening (and I still kinda am!). I prefer to take more of an ad hoc approach when I design a garden, especially when it comes to my annual garden. First, you need to determine how much sun the garden area gets. 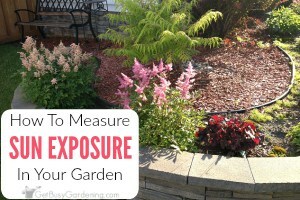 If you’re unsure, here’s how to determine sun exposure in your garden. 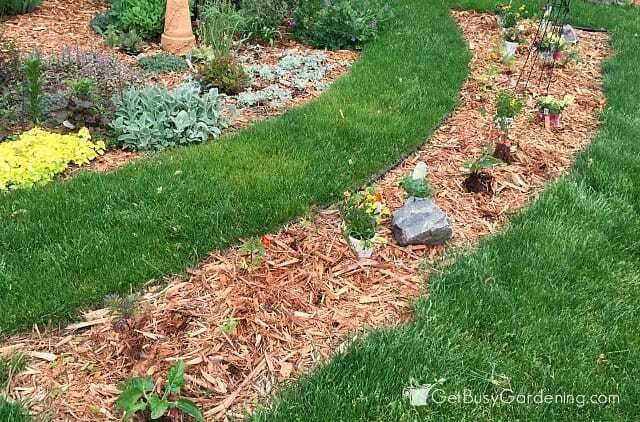 This way, you’ll make sure to buy plants that will thrive in your garden. Whether it be full sun, part shade, or full shade, you can find beautiful annual flowers to fill any garden space. You can create additional height in your garden using climbing plants, like the sweet potato vine I have growing on an obelisk in my annual garden. I absolutely love using obelisks in my garden, and I have several. They come in tons of different shapes and sizes (these are a few of my favorites… spiral obelisk, circular obelisk, diamond obelisk ), and really add a lot of character to the garden. 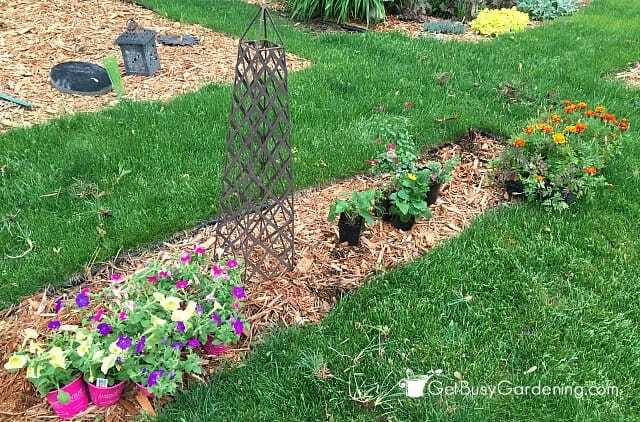 You could also use an inexpensive fan trellis or even something you already have on hand like a tomato cage to add height too. I prefer to use shorter supports in my annual garden because it’s in front of another garden. 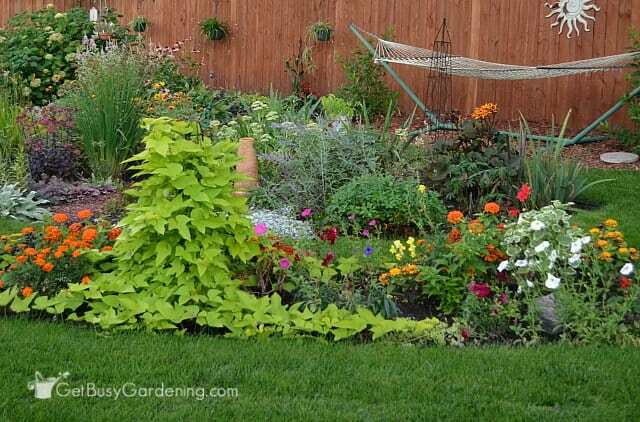 But if your annual garden is up against the fence or house, you could use a taller obelisk or trellis and grow a larger annual vine like morning glories. Gorgeous! Now for the fun part, it’s time to go shopping!!! Now that you have an idea of what types of plants to buy, it’s time to head to the garden center. Look for annuals that are different heights, colors and textures. Buy plants in groups of 3, the garden will look fuller if you put the plants in groupings. You can buy as many different types of plants that you want, depending on your tastes. Some people think that using too many different types of plants and flower colors make a garden look too busy or messy. So, if you prefer, you can choose 3 -5 different types of plants, and create more of a formal annual flower garden design. 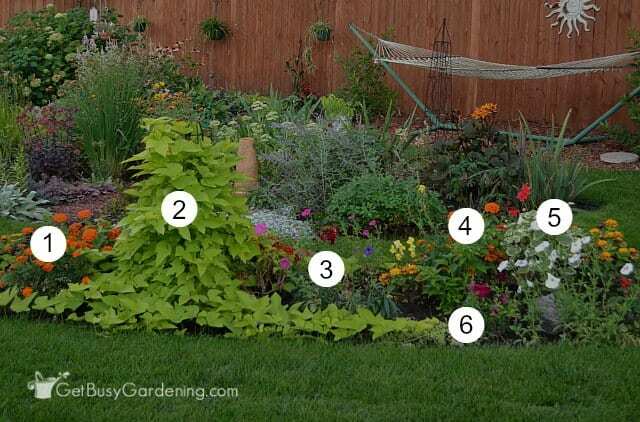 If you’re completely clueless about how many plants you need to fill your annual garden, look at the tags on the plants to see how large they get and how much spacing they need, and calculate accordingly (if you’re good with math like that). Otherwise, measure the area of your garden space and ask someone at the garden center to help you figure out how many plants you need. 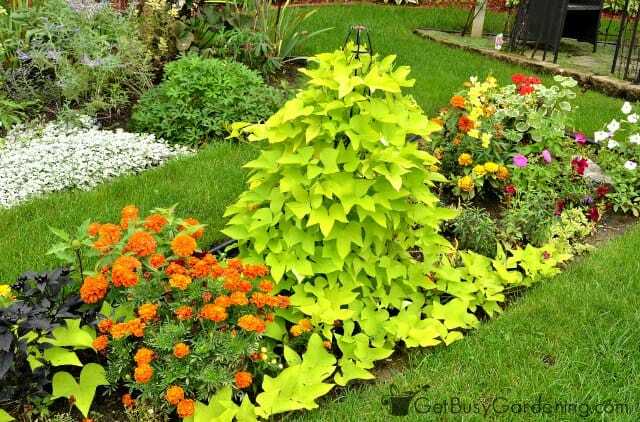 Annual plants can be crowded together tighter than perennials, since they will only last one growing season. 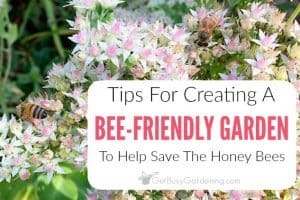 So you don’t have to worry about spacing too much, but do pay attention to how large the plants will get and space them accordingly so one plant doesn’t take over and crowd out smaller plants by mid-summer. Don’t worry, after you do this once or twice, you’ll have a much better idea of how many plants to buy. After you get home, lay all of your plants out on the ground so you can easily see everything you have. Yes, it can get messy, but I find it easier to design a garden area when I can see all the plants I have to work with. Next, grab the plants that will grow the tallest, and put them in the middle of the garden (or in the back of the garden if it’s up against a fence or something). Once you figure out a placement you like for the taller plants (don’t fuss over it too much, you can always move it once you have all the other plants placed), grab the next tallest plants. You can use these plants to fill in between the taller plants, place them in front of the taller plants, or around them if you prefer. 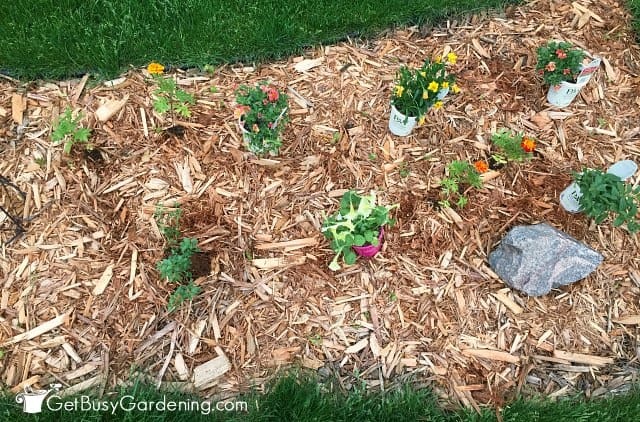 Continue layering shorter and shorter plants (adding the ground cover plants last) until you’ve placed all of your plants. Now, take a step back and see if you like it. If not, re-arrange things until you come up with an annual flower garden design you love. If you’re still unsure, leave the plants as they are for a few days and sleep on it. 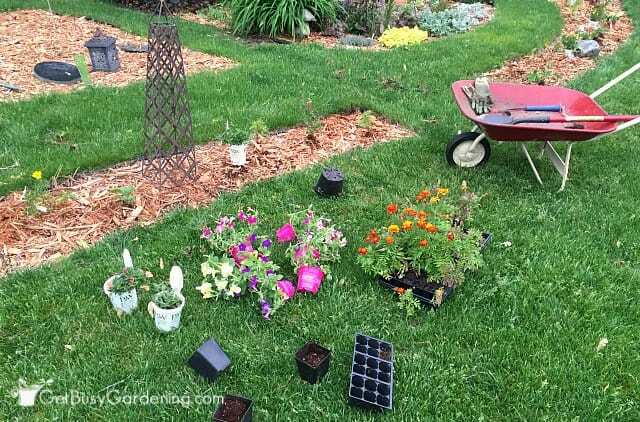 Since everything is still in pots, you can keep moving stuff around until you find the perfect layout for your annual flower garden, and there’s no rush to get it all done in one day. Sometimes I find it helpful to take a few pictures too, which can help you figure out what’s missing or misplaced. 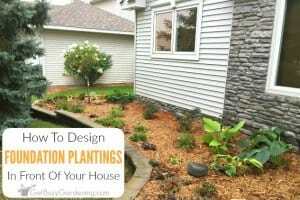 Now that you found a design that you love, all you have to do is pop the plants in the dirt! Leave everything right where it is, and work to plant them one at a time so you don’t lose your design (this is where the photos help too, just in case you move too many things while you’re planting stuff). I find that planting everything is the part the goes the fastest after I figure out my design. Now it’s your turn. 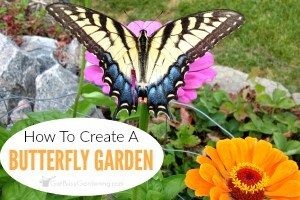 What steps do you take when you create your annual flower garden design? Share your thoughts and tips in the comments section below. i love the garden it is wonderful and pretty. i have to say that potato vine bring out the look. i love all of the flowers that’s on this pic. I’m really going to start my garden when the weather breaks. i can’t wait. thank you. Thanks, I’m glad you like my annual flower garden! Have fun planting yours, I hope it will grow great for you! Sure. Shake off as much of the soil as you can, then gently tease apart the roots of the individual plants to separate them.